I'd like to start by saying that I can see some real potential with the application so far, there are a few things that I would personally change or allow options to alter and some possible bugs or oversights, but I will get to that shortly. So far it's quite a nifty little development and I just happened to stumble upon it randomly, thought I'd give it a test run and provide some feedback. Generally speaking I couldn't use this in any real use case scenario as it is, but with a little work and a few updates I could see this being something that anyone could use efficiently for creating static sprites, tiles or quick concepts without all of the clutter that some other applications provide. With that being said, the main reason is solely due to efficiency. I've found myself clicking more and more (even with the cool little quick access menu) for things that I shouldn't have to click so often to achieve. I did have a few issues regarding the colour palette and I will explain in more detail below but all in all, I enjoy the concept behind the tool, and I would use it again after some updates! Some of the icons where really hard to make out what they did, hovering over them made it clear for most but I still found myself struggling to grasp what I needed on the fly when I was quickly throwing up the menu and looking for a tool "quickly" but aside from that the animated icons I think are a little much, perhaps a small 1 pixel offset in scaling from the darker to lighter colours that are currently used might be a more subtle and defining "this is selected" animation. Just a minor suggestion. The icons are something that I would focus on, make them a little more definable or easy to read as a whole. If you could improve the quick access menu to be naturally quicker to grab tools on the fly, I would propose something along the lines of a pie-menu that can expand for additional choices of tools, this would be quicker and allow to quickly select the previously selected tool type and potentially avoid the issues of mixing up which icon is for what. This is really off putting while working on a sprite, I liked that I could zoom out after through the process and see that though, is there any ability to add a custom image, or the ability to turn it off, I would prefer to be able to toggle it on or off more than use a custom image. This is where I noticed the most issues when using Pixel Proof. First of all, I love the scrolling through colours using the "[" and "]" keys. Although it doesn't seem to be based on the actual palette created by the user. When I added colours to the quick menu (the only place to add colours) I wasn't able to scroll through them with those hotkeys. Also, when I click the "+" to add a new colour to the palette, the window to select the colour to add pops up in the top left corner of the screen, not the window of the application or the center of my screen which would be preferred if I had to chose, it would be best if you could set this to remember the last location for more convenience. Mostly so far these issues I have been pointing out have been fairly minor and what I would consider to be easily fixed (within reason) but one thing that got me worse than all of these minor annoyances was the fact that when I was experimenting with the software I entered "viewer mode" and couldn't get back out of it. The notifications or help for such things isn't really around from what I saw, but I hit "ESC" as I figured that would cancel the mode but it closed the entire application. This wasn't much of an issue as a whole, but when I loaded the file back up I was really annoyed at the fact that the palette that was frustrating to create was not tied to the save file that I created, so I had the default colours and no real way to easily recreate the palette that I use, so instead I ended up using the default colours and couldn't be bothered enough to finish my sprite concept in Pixel Proof. For the life of me, I couldn't figure out how to move the selection set I had made, which was really annoying. I did try a variety of things but if this doesn't exist, you should definitely work towards adding the ability to move a selection. I am not refering to the "Truck" tool either, that is a really nice feature but not what I am talking about right here. I really do love some of the features, the pixel perfect "pixel tool" is nice, makes drawing things easier requiring less editing after when regarding curved low resolution pencil strikes. Also, the ability to select which tools are tied to the mouse buttons is a very nice feature, some applications allow the right mouse click to grab a colour others force it to erase and there is no easy way to alter, this software allows you to change to any tool as required per task, I love that! 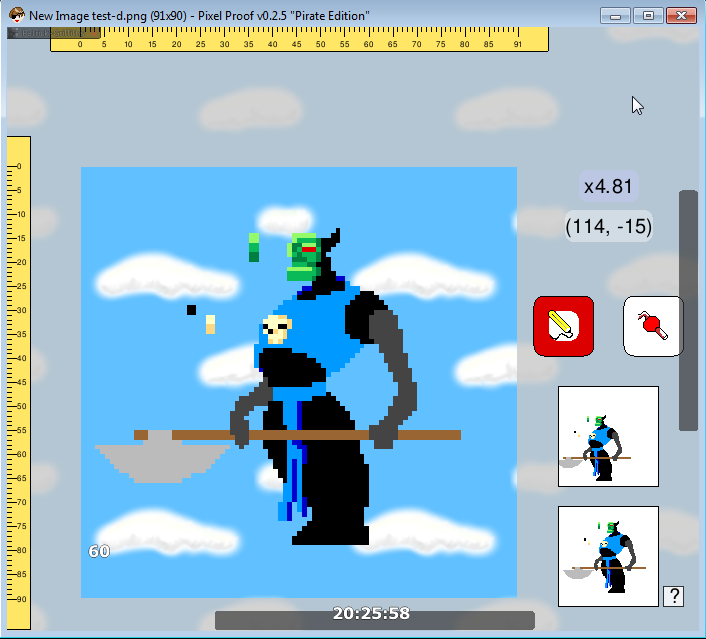 -- The ability to pan the tile or sprite to create a better tiling sprite is something that many pixel artists have grown to love about other software and this is definitely a great feature to have, it will help a lot. A layer system would be nice for testing ideas on sprite concepts out and save some time when trying shading details over tiles and so on without committing to them right off the bat. I do have more to say about this little software and more suggestions that could help improve it, but I don't have as much time to write it all up right now. These are some of the simpler things to address and issues that many will likely face so I thought that I'd stop by and leave you some feedback to take on and work with. I am fond of this, I would love to see it grow and I look forward to some kind of updates. Even with the few shortcomings and annoyances, it's more pleasant to work with than some things out there, once a few of the above mentioned issues are fixed it could be a really speedy way to create a sprite concept on the fly without an over bearing interface which would help when trying to teach someone pixel art too! Jonathon Dearborn, I may be in touch via email some time soon. However I am fairly busy as of late so there may be some delay in me writing. I hope this feedback helps you in any way and I'm open to chatting to further assist with testing if required. This is fantastic feedback, Patrick! Thanks so much! I'll be able to reply in full soon. Thanks for trying it out. :) People actually using Pixel Proof and describing their experience goes a long way toward making it the best it can be for all of us. I'm glad you found some things to like! Pixel Proof is what happened when I decided I had too many good ideas (read: experimental ideas) for graphics editors that weren't in any other editors. Over the past few months, many of these ideas have been settling down into useful (and less experimental-feeling) interfaces. However, a lot of this app is still pretty rough, with original experiments hanging around without any UI to adjust them (like the scrolling background). Can you tell me what, specifically, you need to click a lot to achieve? I'd love to fix whatever that is, assuming it's not covered by the other descriptions. It will also help when the menu is revised. I'll be grouping tools together with spatial partitions so you can find things easier. Even bigger than that, though, will be the custom toolbars I have planned. The quick menu will let you populate the toolbars (one for tools, one for palette) and then you'll mostly use those instead of opening the menu. I just fixed the palette hotkeys '[' and ']' so that the current palette is used. That'll be in the next update. I recently switched to someone else's dialog library, so I don't think I have control over where the color picker appears. In the near future, though, I'll be implementing an in-app color picker instead (for several reasons), so the positioning won't be a problem. View Mode is an experiment that might just go away, and any of its bugs with it. The idea was that the app could be used as a lightweight image viewer that could swap to editing at the press of a key (Enter/Return). I'm not certain this would be useful. I'm still designing the palette management system. Likely, the last palette will persist, you'll be able to save palettes to some palette file and load them again later, palettes may be saved automatically (like GIMP does), and palettes may also be associated with a future editor file format (analogous to .xcf for Pixel Proof-specific needs). Palette editing, too, will be improved, as you can't even delete entries yet. The only way to currently "move" pixels is to cut and paste them... but that needs work too! I'll add something that makes this process better. Thanks for trying it out. :) People actually using Pixel Proof and describing their experience goes a long way toward making it the best it can be for all of us. No problem. I figured that I would use my little free time to give some feedback, I like to see new software cropping up, no matter how small. I also appreciate spriting software there are very few out there that are comfortable to work with, I realize that Pixel Proof is really early on, but the concept has potential. Of course it would be GREAT if there could ever be any potential support for creating animated sprites then it would probably find usage by many more people although it's still fairly early to even expect that, I feel that once you perfect the general flow or use and finish including layers, then it could be a nice thing to work towards (if you ever intend to). The price is really reasonable too. I'm glad you found some things to like! Pixel Proof is what happened when I decided I had too many good ideas (read: experimental ideas) for graphics editors that weren't in any other editors. I feel like this is how many great things start, and this is also why I do attempt to try out new applications from time to time, there are some hidden gems out there which are rather impressive once you find them. I feel like Pixel Proof is definitely heading in the right direction with trying to create something that the user can refine to fit 'their' needs or workflow rather than trying to create a standard that the developer(s) believe is the right way to do things, not to mention some of the tools are nifty here too. I really actually loved how you handle the resizing of the canvas and even the image resizing, being able to drag to resize the canvas is REALLY nice, I don't think I have ever seen this anywhere else (or I cannot remember it anyhow) and the preview of the image and how it will look when dragging to resize that is really helpful too! -- Small things like this are convenient and nice to use. The willingness to respond and deal with feedback to improve the software is something I personally really appreciate, some developers look past that or take the feedback poorly. Keep up the great work. However, a lot of this app is still pretty rough, with original experiments hanging around without any UI to adjust them (like the scrolling background). I assumed this would be the case anyway, I think the icons are understandable but some were a little conflicting with others and when working fast for me it was sometimes harder. It will be nice to see some of the changes you've mentioned here. Being able to place them on custom toolbars (something I wanted to suggest in an email) would void the immediate need to make them more distinguishable. That fix will improve things a lot, I was struggling with that, I ended up painting some blocks into the image and colour picked from them when I needed a colour, I lost some of the progress that I had from when the image I took to share was taken. As for the placement of the colour creation window, it's a minor annoyance, I think that it was more annoying because of how much I would need to use it and then losing the palette was painful that I would have to go through that again knowing I could lose it again, being able to save it out and load it later would make this much more bearable! Having the ability to export the palettes will greatly improve the quality of life to users, even if for whatever reason the palette gets wiped out we can still load from a file which will save a lot of effort and time. and palettes may also be associated with a future editor file format (analogous to .xcf for Pixel Proof-specific needs). Palette editing, too, will be improved, as you can't even delete entries yet. I'm really glad to hear this, colour palettes are an important part of any pixel artist's workflow, you end up changing them over time all too often and being able to share them will be nice as well as just backing them up for personal needs, it sounds like you have the right ideas behind how to approach the various improvements here which is great! Regarding the moving of pixels, I did attempt to copy and paste as a way to move initially, and I even tried to paste something from outside of the application and nothing was working, I assumed it was not supported yet but I suppose it could have been a bug too, I simply didn't get to a few more things that I wanted to express because I was being pulled away from the computer at the time. I was hoping to find the time to write you an email and mention more suggestions, one of which was a toolbar that we could customize and drag around the canvas as needed but it sounds like you've already come to that on your own which is awesome. Once the new update hits with the colour palette fixes, I will happily return to testing it out and providing further feedback. I was experiencing some weird rendering issues with the editor when typing my response, I left this part until last for a few reasons but here I will answer it. Mostly I feel that it's due to the process. Sometimes I would need a tool more than the two available through the custom tools selected for my mouse buttons which required me to bring up the "Quick menu" select a new tool, click out of the menu, use the tool for that one operation, go back and select my pencil tool again. The only way you could improve this is to include hotkeys that can be altered by the end user to couple the already really nice ideas you have here for custom toolbars and so on, this would allow users who prefer an interface and users that prefer hotkeys to mix and match their desired preferences as they see fit, which would be nice. Alternatively you could include one hotkey that provides a context sensitive tool set for the mouse buttons, so if usually my mouse buttons where tied to "LMB - Pixel Tool" and "RMB - Eraser" then if I hold "ALT" or some other desired hotkey they the tools used on those two mouse buttons would be different and to set them when in the "Quick menu" we would just hold the "ALT" key while selecting the tool to use on those alternate buttons that are context sensitive to that hotkey. The above could work as a nice tough without over complicating things too much and allowing those of us to alternate additional tools in a more fluid workflow. Also, I did like that you have the colour picker that reverts to last active tool, that saved some clicking here and there, if you tied that to the alt key alone, that in itself would likely be a huge time saver for people but I'd opt for the above suggestion if you feel it's something you can implement and wish to, as it allows for a little more to anyone's workflow. I just pushed version 0.2.7 and I think you'll appreciate many of the changes. * Palettes should be much better to work with. They are persistent and have save/load now. You can drag them to reorder and hover to get delete and copy options. * The tool grouping in the menu has been reworked substantially. * There's an eyedropper hotkey now. It is bound to the 'I' key, but I'll later be adding keybinding customization so it can then be changed. * Opacity and brush size sliders appear in the main view now, so there's less need to open the menu repeatedly. * There's now a Grab tool that moves selected pixels. * View mode has been disabled. That sounds great. I'll be sure to make some time to check this out tomorrow!! I'll let you know how it goes. Sorry I wasn't able to get that feedback for you the last I posted, but things got pretty hectic on my end. I'll be able to put aside some time and play about with your tool again soon, likely this coming weekend so I'll drop my extended feedback here for you when I get there.